Note: There was a computer snafu this month. Some early feedbacks got deleted from the system. Some work restored the feedbacks. Unfortunately the author information was lost for the restored comments. The first three published feedbacks thus have no author names. It is possible that some feedbacks were lost. Comment: just a quick evolution question regarding sympatric speciation. I continue to see references to this form of evolution as being somewhat controversial - ie that scientists are not convinced that it occurs - the most recent reference in an article on the possible divergence of mormyrid fishes. My question is - are there not many examples of sympatric speciation that are confirmed beyond a reasonable doubt. The best example I can think of is the myriad of African reef lake cichlids that surely must have evolved sympatrically? or does allopatric speciation include groups of individuals that swim a short distance away - this doesn't seem to be true geographic isolation. thanks for any clarification you can offer. Response: You will find a nice summary of the work done on sympatric speciation in Menno Schilthuizen's Frogs, flies and Dandelions . Apart from the cichlids, there are several "host-race" sympatric speciation events, the most famous of which is the Rhagoletis fruitfly speciation studied by Stuart Berlocher and his team [but see the cautionary note here]. The short answer is that it is still highly debated. My own view, for what it's worth, is that the entire debate is miscast - it isn't about location, but about gene flow, and if gene flow can be interrupted for long enough in situ, then that is enough for speciation. The question is whether we have any such examples. Comment: For all the supposedly "scientific" analysis that goes into the attempt to discredit and even deny the ancient record of creation as it's proponents accept it, how can godless skeptics miss the simple logical fact that experience is superior to theory? Hypothetical logical theory requires that the possible existence of a supreme being who is indeed capable of the creation of the known (and unknown) universe also be capable of the interaction and relationships with all who seek to know Him (through the objective humble approach He has advised in ancient scriptural evidence). Those who have had the objectivity to do so have certainly proven to themselves that the experience of God's existence is real. This experience will never be subject to the theories derived outside of personal experience. This is God's way of denying access to greater knowledge to those who are not willing to submit to the objective possibility of His very existence in the proper humility that such a deferential approach demands. Without at least this appropriate degree of faith and humility, how could the vastness of God's unfathomable ability even be approached? This requires the same faith we put into the viability and sustainability of the air we first breathed upon our birth. Who among us doubted it's quality or goodness as we gasped our first breath? The same simple logic and faith is required to understand these deeper issues that was required to address that very first one as the amniotic fluid was coughed out of our infantile lungs! Otherwise our very first assumption is erroneous and our logic and analysis has been derailed at the first and confusingly simple point. Put away the microscope and look into your own eyes with the faith you used to draw your first breath...realizing that you are neither a god, nor an improbable happenstance. Response: The approach you suggest denies the religious experiences of billions of people whose religion happens to disagree with yours, for no reason than because it disagrees with yours. It also denies the objective experience which constrains theory to be what it is -- the objective experience which, if you believe in creationism, is created by God. How do you call that "humility"? Response: The reason for the name change was the rules by which taxonomy operates. What happened was two different fossils named by two different paleontologists were later decided to belong to the same genus. When this happens according to the rules of taxonomy the name that was recorded in the scientific literature first get priority. In this case a partial skull found in England was named Hyracotherium by Sir Richard Owen (who also coined the name 'dinosaur') in 1840. Owen's illustration of the first Hyracotherium fossil found (Owen 1841). Later in 1876 American paleontologist Othanial C. Marsh (who named half the dinosaurs you've ever heard of) named a very similar fossil Eohippus (Marsh 1876). It was obvious to most paleontologists that these fossil were very similar but since the originals were on different sides of the Atlantic ocean it took some time for direct comparisons to be made. Finally in 1932 a third scientist, Sir Clive Forester Cooper, published a paper demonstrating that the two fossil types were so similar that placing them in separate genera could not be justified. Thereafter according to the rules of taxonomy Hyracotherium became the official name for all the fossils and the name eohippus became what is called a junior synonym of that genus. 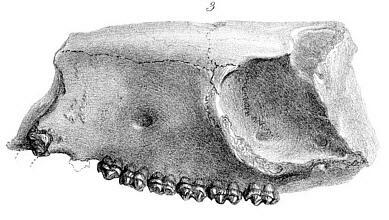 An illustration of a complete Hyracotherium skull (Romer 1966). A similar situation occurred with the dinosaur Apatosaurus which was at one time known by its more popular, and evocative name brontosaurus (which means "thunder-lizard"). Coincidentally this case also involved O. C. Marsh, however in this case he named both genera. The current taxonomic rules for the naming of animals (fossil and living) can be found in the International Code of Zoological Nomenclature. The claim that Hyracotherium either is a hyrax or is even "practically identical" to a hyrax is patently false as anyone who takes the time to compare the two can easily see. Without intending to imply that the present small extinct Pachyderm was more closely allied to the Hyrax than as being a member of the same order, and similar in size, I propose to call the new genus which it unquestionably indicates, Hyracotherium, with the specific name leporinum. The Order Owen is referring to here is "Pachydermata" (after Cuvier) which is no longer considered a valid taxon. It included elephants (obviously), even-toed ungulates (cows, deer etc. ), odd-toed ungulates (including horses), hippos, pigs, and the hyraxes. So his placing Hyracotherium in the same order as hyraxes wasn't really saying much for their being all that similar. In the list of Artiodactyls he lists Hyracotherium. In the Perissodactyla he lists the hyrax (and of course the horse). So Owen placed Hyracotherium in one branch of the order and hyraxes and horses in the other. If anything this would imply that he thought hyraxes and horses were more similar to each other than either was to Hyracotherium. He was wrong of course, but again, all he had of Hyracotherium was a crushed partial skull, so he can be forgiven. Modern antievolutionists, on the other hand, have no excuse except intellectual dishonesty. Owen, R. 1841. "Description of the Fossil Remains of a Mammal (Hyracotherium leporinum) and of a Bird (Lithornis vulturinus) from the London Clay." Transactions of the Geological Society of London , Series 2, VI:203-208, 1 plate. Romer, Alfred Sherwood (1966) Vertebrate Paleontology (3rd Edition), p. 265. Comment: I'm just asking to know...what is your opinion of the True.Origin Archive? I know that you may not want to comment on a specific external website generally, and that you rather answer their individual claims from a scientific perspective, but I just wondered what you think of the general validity of their arguments and their self-alleged 'intellectual honesty'. I wondered because claiming to be honest and truthful they fall, like so many others, into the pile of 'rubbish' creationist websites (although actually I'm yet to find a 'good' one), and inject the same religious bigotry into their arguments, saying that unless you support their narrow Biblical interpretation you are not a Christian. They seem to hinge all of their arguments on the idea that to accept evolution you have to be atheist/naturalist. The article commenting on this archive, Deception By Omission, seems to be saying that the Christians who contribute are not truly Christians but are just part of some ploy to make evolution seem attractive to everyone. How such a blatantly untruthful and bigoted claim can be put on a website claiming intellectual honesty I don't know. Furthermore, why are creationists so scared of atheists/agnostics/liberal Christians/theistic evolutionists anyway? They constantly assert that the theory of evolution leads to Nazism, nihilism etc. Instead of focussing solely on the scientific points, they have to lie in order to scare the gullible by making evolution seem immoral, neglecting the fact that evolution is descriptive and that social Darwinism rests on a misinterpretation of natural selection. Could it be that they are actually unsure of the science they use (nonetheless they should be anyway as a lot of their science is wrong - why on earth do they still cite the 2nd law of thermodynamics?? Surely they realise that if it really did pose a problem to evolution it would have been resolved by proper scientists??) that they resort to discrediting opponents and lying, not least by criticising your excellent archive unfairly. Comment: I am an anthropology major at my university and I am taking part in a self-guided/self-defined course on the history of the fight between science and religion and will pay special attention to the fight of Christianity against evolutionism. I have found a lot of resources so far, but I was wondering if you had any helpful hitns for books or articles to look into for my literature review and subsequent use for resources. Any help would be much appreciated. Keep up the good fight! Response: The fight is not between science and religion or between Christianity and evolution. Christianity and evolution are on the same side. The fight is between science, most of Christianity, most other religions, and others on one side against mainly fundamentalist sects of Christianity, Islam, and other religions on the other. The former regard religion as personal, and their science is described, not decreed. The latter believe that their religion must be inflicted on others and on the universe as a whole. Response: Apparently, Hovind's "PhD" has become enough of an embarrassment to him that he has removed mention of Patriot University from his web site. However, a page of his talking about it still exists on web.archive.org and is linked and quoted here. I have seen his thesis myself; it says "PATRIOT UNIVERSITY" at the top of the title page. Comment: Which is the bigger fairy tale, a couple of atoms collided in space, the world as we know it just happened and we have life or belief in the Bible - its all about Faith and i am afraid to say it but one day we all will no the truth. We must really be weak or confused to really hang onto a theory from one chap called Darwin. It's curious you pose the question asking which one is the bigger fairy tale. No where in evolution do we have talking snakes or donkeys, imaginary creatures, warrior heros, or clashes of the gods. But we do in fairy tales and the Bible. Comment: I was reading through the FAQ "Observed Instances of Speciation" and was having a few problems. 1.) I'm not the smartest in the world but maybe there is a way to put this in simpler terms. I had a hard time understanding it. 2.) Most of what I read seemed to be ovservations of things that happened within certain species (e.g. flies, plants, etc.). Isn't there something that shows water dwelling creatures needing to breath our air and needing to grow legs to survive? Or maybe a group of land dwelling animals who have to learn to survive in the water begin to shorten their legs and eventually learn to breath under water? Has anything remotely like this been observed? If so, is there anywhere I can read up on it without having to have a Ph.D. to understand? Response: I'm not going to try and give a simplified version of the FAQ in question, I'll leave that for someone else to attempt; however I will take a shot at addressing the second part of your comment. The short answer to your question is no. There have been no direct observations of say, fish, sprouting lungs or legs before our eyes or of fish without lungs or legs giving birth to offspring that do, and if our understanding of how evolution works is even remotely close to how it does in fact work, then we shouldn't see such things. Your question illustrates a very common misconception about how evolution works and a source of a common antievolutionist attack on evolution (of a sort that is a special pet peeve of mine). Time and again antievolutionists will wave away examples of speciation as simply being "variation within a kind" and demand to see documentation of much more radical changes as evidence for evolution, like a fish turning into amphibians in one or only a few generations. The problem with this is evolutionary theory predicts that we shouldn't ever see such radical transformations within the lifetime of a human being. According to our understanding of genetics and the mechanisms of speciation all we should be able to see within our lifetimes are exactly what we do see, small changes from one species to another. For example a new, slightly different, species of guppy arising from an already existing species of guppy. The sorts of changes required for amphibians to evolve from fishes would take many hundreds of thousands, or more likely millions of years to occur, and through innumerable intermediate speciation events. For evidence of this we have to look elsewhere (the fossil record, genetic comparisons etc.). So ironically antievolutionists demand to see as evidence for evolution something which evolutionary theory says shouldn't ever happen (heads they win, tails you loose). In fact, if guppies ever did start giving birth to salamanders, that would be a miracle (creation? ), not evolution. Comment: after reading your articles on the skepticism of the flood ever happening, i have found several errors which have been stated. the major one would be how one article "the vapor canopy hypothesis holds no water" it is stated that the flood waters would have to be higher than mt. everest. just a problem there: mt. everest WASN'T THERE before the flood!!!!! because of the cataclysmic size of the flood, the whole geography of the earth was redesigned (because of the floodwaters coming UP FROM THE EARTH and it was a world wide flood). this was not a little- couple- dozens- of- feet and sprinkle of rain type of flood, it was extremely violent (Genesis 7:11-12). that is all i have to say. All the high mountains were covered, and that's all the Bible has to say about that. Comment: Gasp! I just finished reading the entire feedback archive, and all I can say is, ye gods, you people are patient. A few other quick comments, though. Number one, advice to people submitting feedback--Mr. Spellcheck and Mr. Paragraph are your friend. Mr. Caps Lock probably isn't. Mr. High Horse definitely isn't. Mr. Search Function is the best friend you could ever have. Number two . . . Kent Hovind, man. It's amazing that the two parts of the Bible he doesn't seem to take literally are "render unto Caesar what is Caesar's" and "thou shalt not lie." Number three, a brief comment on religion and evolution. My Catholic mother accepts evolution with no problems, as did my Methodist minister grandfather on the other side of the family. (My dad converted.) I'm a Pagan, and I accept it. Many, many, many people have no problems with belief in a divinity and acceptance of the wonders that science provides for us. I firmly, passionately believe that, whatever form God takes, He or She or It wants us to use our brains. This means looking at the evidence left behind by Him or Her or It, and that evidence clearly points toward evolution. Biblical inerrancy is not only a logistic impossibility (see the many, many Biblical contradictions) but makes Him or Her or It into a liar lie-y head. In fact, teaching biblical inerrancy probably tears more people away from the faith than teaching that there is no inherent contradiction between science and faith, that they cover entirely different spheres. Just ask the guy who wrote Misquoting Jesus what he thinks about Biblical inerrancy. An apatosaurus-like dinosaur may still be alive in swamps in the Congo. 1. The reputed “dinosaur,” Mokele-mbembe , is folklore. O'Hanlon (1997, 373) reported the answer upon asking a native if he had seen Mokele-mbembe: "What a stupid question," said Doubla, looking genuinely surprised. . . . "Mokele-mbembe is not an animal like a gorilla or python. And Mokele-mbembe is not a sacred animal. It doesn't appear to people. It is an animal of mystery. It exists because we imagine it. But to see it--never. You don't see it." Other reports, though some treat Mokele-mbembe as real, are also folkloric; they make good stories, but there is no tangible evidence. It is nigh impossible that a population of very large, very distinctive land animals could have eluded human exploration so completely. 2. A living dinosaur would not be a problem for evolution even if it existed. 1. “The reputed "dinosaur," Mokele-mbembe, is folklore.” Actually it is and it is not. Natives have many legends about the creature and many other natives claim to have seen the creature for themselves. Something else that Talkorigins fails to tell the reader is that natives have not been the only ones to have seen Mokele-mbembe. The sightings are listed below: In 1776, a French priest said he saw a number of Mokele-mbembes feeding on plants near the shore of a river in Central Africa and found very large tracks spaced 7 to 8 feet apart with three claws on each one. While near Lake Tele in 1980, Herman Regusters and his wife saw what they thought to be Mokele-mbembe. At Lake Tele in 1983, Marcellin Agnaga was on an expedition when he said he saw Mokele-mbembe swimming in the lake A man named Alan Brignall was working in Northern Zambia in May of 1954 when he saw Mokele-mbembe. In the 1950’s, a man who wanted to remain anonymous was working in the Congo when he saw a mokele-mbembe’s long neck and head emerge out of the Congo River. French man by the name of J. M. Lefebvre said he saw Mokele-mbembe in 1963, while hunting with a friend (Lem Bauer). A. S. Arrey was housing some British soldiers in 1948 near Lake Barombi in Northern Cameroon. While he and some others were swimming in the lake, something broke through the surface of the water. It was two Mokele-mbembes. On January 10, 2006, missionary Paul Ohlin claimed to have observed a dinosaur-like creature in the Sangha River. Clearly you can see that Mokele-mbembe is not just on old fable like they claim, but rather a living creature. Next they list a case of a native claiming that Mokele-mbembe is not real. This semi-rare, as some natives are very superstitious about animals. Some even say that Mokele-mbembe is even a god. “It is nigh impossible that a population of very large, very distinctive land animals could have eluded human exploration so completely.” The Likouala Swamp is 55,000 square miles of almost the worst place on earth. Explorers rarely visit the area and it is mostly unexplored. A large animal that hides in the water could easily remain not found. However some explorers claim to have encountered the animal. “A living dinosaur would not be a problem for evolution even if it existed.” Almost all evolutionary books and videos claim that dinosaurs went extinct 65 million years ago and the ones that did not die out evolved into birds.Also, according the evolutionary geology that African jungle has changed drastically since the Cretaceous! Response: Claims such as those are entirely consistent with folklore. Some people make up such stories just to place themselves at the center of attention. Some people see something unclearly and interpret what they see to fit the story. (This may be particularly true of non-native explorers who really want to find the creature.) Some people tell innocuous stories ("I saw something strange") which others twist to match the standard story ("He saw mokele-mbembe"). Some people dupe others with practical jokes or frauds. Some people make up stories about stories to sell books. I don't know how prevalent such things have been regarding mokele-mbembe, but all of the above have occurred with the similar folklore of ghosts, Bigfoot, and UFOs. I don't see any reason why mokele-mbembe would be an exception. I would love for mokele-mbembe to exist. Aside from the sheer thrill of it, evolutionary theory would surely advance with such a creature to study. Unfortunately, the evidence for its existence is impossibly weak. Comment: THE EVOLUTION THEORY, ABOUT THE ORIGIN OF ALL SPECIES, IS A BELIEF, NOT SCIENCE BECAUSE IT LACKS PROOF. IT IS A BELIEF IN A MIRACLE: THAT SOMETHING CAN DEVELOP FROM NOTHING IS A MIRACLE. SELECTION CANNOT BE THE ORIGIN OF NEW SPECIES: YOU CAN SELECT NOTHING FROM A GIVEN COLLECTION WHEN IT DOES NOT ALREADY EXITS IN THAT COLLECTION. MUTANTS CANNOT PRODUCE NEW SPECIES: THEY ARE STERILE. Comment: this is pretty funny. you are very ignorant to the facts and have a great imagination. i'm going to pray for you. Comment: With all of the controversies over evolution and creation, do you think that there should be a giant debate where the scientists of the world come to ratify the science? It'll be like the Constitution of Science. As the Founding Fathers sat down and created a government after long hours of deciding how it would work and signed the parchment, should scientists of the world come together, vote, and sign on what is what? It seems some scientists have their own ideas while others have different ideas. It would be nice to have a universal science constitution. Response: Science isn't like that. It isn't decided once and for all what the nature of science or a scientific theory is - rather it develops as knowledge increases and theories are refined. The idea that there could be a "constitution" would suffer the same problems that Originalism suffers for the US Constitution - it would not settle the debates but cause more as the changing needs of science had to be squeezed into a verbal framework. The motto of the Royal Society - the first scientific institution - is "Nullius in verba", not in words. Science is about data and experiment, not formal declarations. Anyway, so far as the scientific community stands now, or at least those relevant aspects of it that don't include business degrees or theological qualifications or dentistry expertise, is concerned, the vote is in. Evolution happens. Response: Yes it does illustrate evolution, microevolution driven by natural selection, and that is all anyone has ever claimed that it illustrates. On the other hand you should understand that even if the peppered moth had been observed to give rise to a new species (macroevolution) then it would only have been a new species of moth very similar to peppered moths. The observation of anything else would run contrary to our understanding of how evolution works. To reiterate what I said in an earlier feedback response, if peppered moths started giving birth to beetles or mosquitoes that would be a miracle not evolution. Comment: Claim CA001.1: Since evolution began to be taught in public schools, crime rates and other social ills have increased. "In the United States, at least, most people do not believe evolution. If social ills follow from belief about origins, creationists deserve more of the responsibility." In rebuting the above claim, you mention most people in the US do not believe in Evolution. This is not a true statement. The majority of people in the US believe in Evoultion, this is why it is taught in public schools here. A minority of the US believes in Creationism. Response: Polls have consistently shown that approximately 50% to 55% of the people in the United States believe in creationism. Here is one such poll done recently for CBS News. Other polls show acceptance of evolution increases with education, and, of course, it is accepted essentially universally by scientists who study the subject, which is why it is part of schools' science curriculum.